It's not as if there hadn't been any closer alternatives. Both my home countries sport plenty of ski hills, some small ones within a few hours' drive and some really big ones a 6h flight away. So why was it that I have recently undertaken a round-the-world journey with the main destination being the snowy mountains of Hokkaido, Japan's northern island? It wasn't because of the 8 meters of average annual snowfall (although that sounded good), nor because of the depreciated yen (although that helped), nor even for earning more frequent flyer miles (I redeemed some). 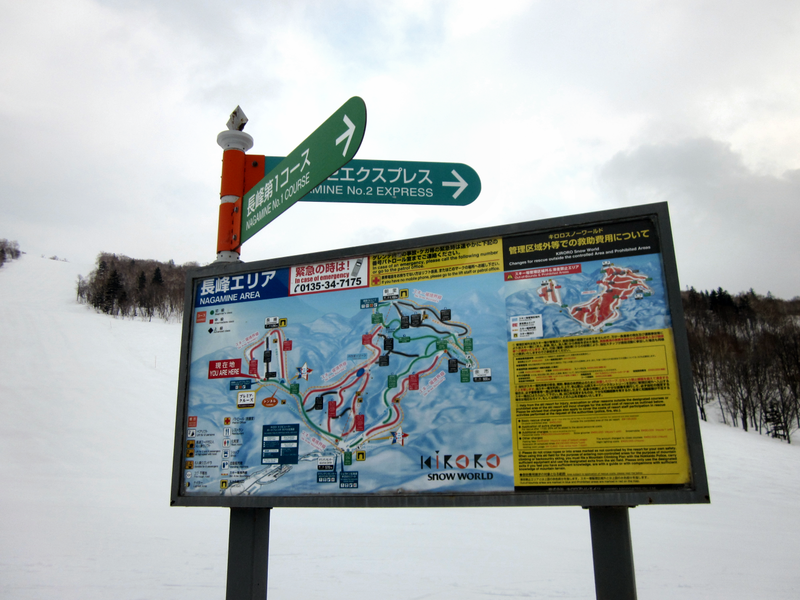 It was to expercience skiing that is different. On previous visits to the land of the rising sun, I was intrigued and amused by the unique ways in which the Japanese do things. Often processes, habits or devices would look completely bewildering at first, only to make perfect sense once you'd understood how they worked. Undisturbed by western standards, Japan has developed its own modus operandi, frequently with amazingly good results. During my stay at a mid-sized mountain resort, where I was one of but a handful of caucasian visitors, I found many examples of an unconventional approach. From the smart management of equipment rental (punch your particulars and skills into a terminal, store it on your ski pass, then go to a counter where everything you need is waiting for you in your size) to the efficient lunch order process (review available options on big boards outside the restaurant, pick a card with the number of your choice, give the card to the chef, pay for your meal while he prepares your dish, leave), countless interactions were designed in unexpected, clever ways. Smart design extended to physical infrastructure as well: Chairlifts all came with safety restraints and snow protection hoods that opened and closed automatically. Tiny lockers featured illustrations on how to stow multiple ski and snowboard sets in them. Next to them, air compressors were available to blow-dry wet skis prior to putting them away. To rehydrate after a day out on the slopes, the ubiquitous Japanese vending machines offer refreshments. The more money you put in, the more lights go on, highlighting which products can be bought with the inserted credit. Should you thirst for harder stuff, fully automated beer pouring machines will tilt your glass at the right angle to ensure a good fill, then stand them upright for a final dash creating a nice foam head. These quirks provided the entertaining and inspiring backdrop to what was a very enjoyable ski break. The quintessential Japanese friendliness and stellar customer service mentality saw me perfectly taken care of: A lack of English skills did not stop staff from greeting and thanking me everywhere, all the time. And I certainly can't imagine the grumpy attendants manning Swiss chair lifts bowing to me every time I get on or off. With Hokkaido being famous for the freshness of its seafood, the culinary offerings in the resort did not disappoint. The sea was visible on the horizon from the mountain's summit, and over the duration of my stay I must have eaten most of its inhabitants. To digest, few things can beat a steaming hot thermal bath with a view of the calm winter wonderland outside. No Vodka Red Bull-infused après-ski brouhaha here - just perfectly zen relaxation. Until you notice the gaudy Hello Kitty and Pokémon stores around the corner. Nippon ni yokoso!